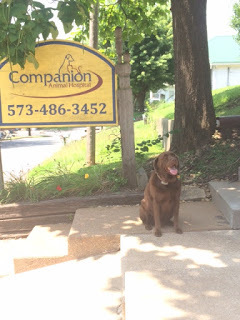 Companion Animal Hospital in Hermann, Missouri is Lewis’ trusted vet. 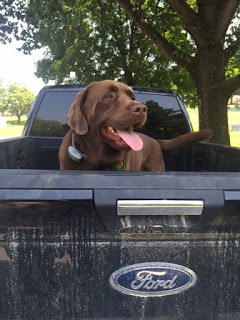 His latest regular check up showed that even though he’s been chowing down on scrumptious Hermann Hill leftovers, he is certainly staying in shape with his daily walks with Terry. Overall, Lewis a very healthy and happy dog. 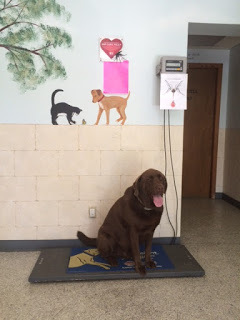 Lewis has been attending visits at Companion Animal Hospital since he was a puppy. Companion has two locations, one in Hermann and one in Montgomery City and specializes in domestic animals as well as grooming, boarding and surgery for pets. The two vets that work for Companion bounce between both locations to help make visits easier for residence in the Hermann area.